A warm welcome to the beautiful Gold Coast and to Broadbeach, the coast's premier dining, entertainment and shopping district. Allow our friendly and knowledgeable team help you discover the best of what the Gold Coast has on offer. Located in the heart of Broadbeach, Sofitel Gold Coast Broadbeach features 296 beautifully appointed rooms and suites offering ocean or hinterland views. Hotel facilities include the award-winning restaurant and bar, Room81; Bistro On3; and TC's Bar and Gaming Lounge, as well as an internet lounge and library, a gymnasium and two outdoor pools overlooking Broadbeach. The hotel faces the Gold Coast Convention and Exhibition Centre and is close to golf and theme parks. 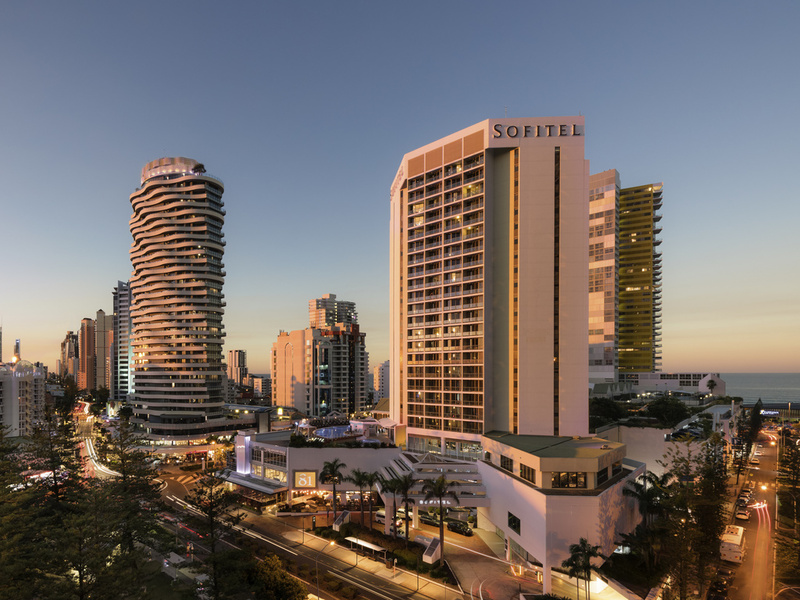 Providing the ideal base for exploring the Gold Coast, Sofitel Gold Coast Broadbeach is located in the heart of Broadbeach within easy reach of attractions, restaurants, shops and bars, as well as Surfers Paradise, the Gold Coast theme parks and Brisbane. Spacious, uncluttered and filled with natural light, guest rooms at Sofitel Gold Coast Broadbeach offer a peaceful haven, providing everything needed for a perfectly restful night's sleep - including the supremely comfortable Sofitel MyBed and a pillow me nu. Each room at this elegant Gold Coast hotel room features a large marble bathroom with luxury French toiletries, an LCD TV with movie channels, robes and slippers, a minibar, and a private balcony with spectacular views over the hinterland or ocean.